Mixed rice preparations or ‘chithrannam’ (சித்ரான்னம்) are usually made to bring out one specific ingredient’s flavor and taste. 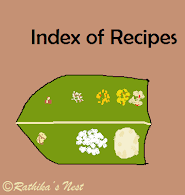 Some of the examples are tamarind rice, lemon rice, coconut rice, curd rice, tomato rice and sesame rice. Mixed rice also helps you to get a meal ready at short notice. Make one or two mixed rice preparations and serve with pappad or chutney. Your quick meal is ready! *Alternatively, you may use 2-3 green chillies, chopped finely. Grate the white meat of the coconut and keep aside. Heat coconut oil in a kadai, add mustard seeds, and once they start to sputter add Bengal gram dhal and urad dhal. Fry till the dhals become golden brown in color. Add asafoetida and grated coconut to the oil. Sauté for a minute and switch of the stove. Add the fried items and required salt to the rice. Mix well and garnish with curry leaves. Heat ghee in a tadka pan or spice pan (தாளிக்கிற கரண்டி) and fry cashew nuts till they turn light brown. Add to coconut rice and mix well. Serve with appalam or vadam.